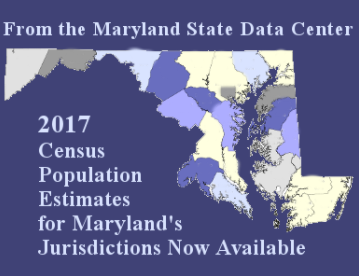 The 2017 numbers show that Maryland’s population grew by 27,475 people between July 1, 2016 and July 1, 2017, with the majority of the increase in the Central Maryland jurisdictions of Montgomery, Anne Arundel, Howard, and Frederick counties, where nearly 85 percent of the growth occurred, according to recently released population estimates from the U.S. Bureau of the Census. Frederick County had the largest percentage increase in population (1.7 percent), followed by Charles (1.4%) and Howard (1.3%) Counties. Kent County had the largest decline (-1.4 percent), followed by Baltimore City (-0.9 percent). Montgomery and Prince George’s counties had the largest increase in international migration, with 11,090 (38.2 % of total State international migration) and 6,523 (22.5%) respectively. Maryland gained 29,031 residents through international migration but lost 23,894 residents to domestic out migration. Frederick County had the largest increase in domestic migration with 2,241, followed by Charles County gaining 1,359 residents. Baltimore City lost 9,209 residents to domestic out migration.